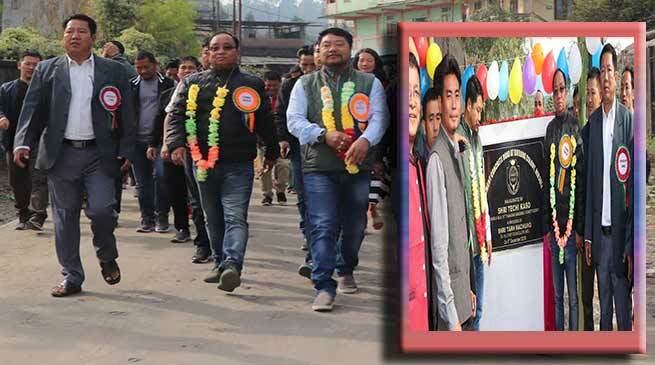 Itanagar MLA Techi Kaso inaugurated 450 metres long CC Pavement road to Dikrong Colony on Thursday. The Cement Concrete Pavement road measuring around 450 metres long to Dikrong Colony inaugurated here today by Itanagar MLA Techi Kaso. Addressing the locals at a function here at Dikrong Colony MLA Kaso said that the basic need of the people at present context are road, electricity, water supply, school and medical facility which he is taking care since his very beginning of the political carrier as a social worker, as Bazar Committee President, ZPM and now as a local elected representative of the capital. He said that the commitment made to the people of the colony have been mostly fulfilled. Rest if any will also be taken care in due course of time and urge upon the people to have patience. He also assured to support and extend help at any time of public requirement and urgency. Guest of Honour, former IMC Deputy Chief Councillor Tarh Nachung in his address said that even if the election is nearing the leaders are always there if he is elected or not but the locals also need to continue to support and extend their sincere responsibility for the development of their area and society and appeal one and all and the local committee members to cooperate each other for peaceful co existence, peace and development of area. Naharlagun PWD Executive Engineer Techi Nabo, local public leaders and other official of the area were present on the occasion. Dikrong Colony Welfare Committee (DCWC) Chief Patron Vijaya Dupit, President Tagia Ginglo, General Secretary Chakpu Tarang among other also address the function. Later the dignitaries also visited few more local roads and under construction culvert in the Dikrong colony and assured necessary fund for its competition.